Why do we need an Ontario Organic Regulation? To protect organic farmers who have worked hard to meet the standards. To reduce consumer confusion and maintain food integrity by protecting consumers from misleading use of the term. To create a foundation for additional support of organic farmers in Ontario. To support data collection for better economic monitoring of the sector. Who is responsible for enforcing the Canadian Organic Standards (COS) in Ontario? According to the Canadian Food Inspection Agency (CFIA), any agricultural product that is labelled organic is regulated by the CFIA. However, the CFIA does not typically investigate complaints about misuse of the term unless the product a) bears the Canada Organic Logo or b) carries an organic claim and is being sold outside of its province of origin. Within individual provinces, enforcement of the Canadian Organic Regime (COR) has been left to provincial government. If a provincial government has not enacted Organic legislation, then the COR is not typically enforced. Why does the organic brand matter? Ontario farmers and food businesses are world leaders in environmental stewardship. Both organic and non-organic entrepreneurs introduce innovation and support sustainability to differing degrees. Some are more proactive than others. Some choose to become certified organic, while others choose to meet different types of farming and food production standards. It is critically important to the Ontario organic sector that this wide spectrum of innovation exists, because it means that there is a diversity of choices for consumers. Innovators who operate outside of the status quo push the boundaries of organic and ecological agricultural practices, and lead agriculture toward a more sustainable norm. However, organic means something very specific. It is the only third-party verified claim that captures and ensures that many of these practices are being employed consistently and that improvements are being made over time. The Canadian Organic Standards are continually being revised, in collaboration with farmers and stakeholders from across the country, to ensure that they incorporate ongoing research and best practices defined by the industry. The existence of the organic brand pulls the entire agriculture sector in a more sustainable direction. It is the most recognized, rigorous, and verified benchmark for ecologically appropriate farming practices. Without it, it would be difficult to measure a producer’s dedication to sustainability, and place value on it in the market. How does a lack of regulation impact the organic brand? When anyone can use the term organic, producers and businesses who work hard and incur additional expenses to meet the requirements of the COS are forced, unfairly, to compete with those who do not. This can be confusing to consumers, who should not be tasked with assessing the claims made by each producer they purchase from, every time they shop. Many honest uncertified producers work to not only meet, but exceed the requirements of the COS. However, some also mistakenly assume that foods which are pesticide, herbicide, and hormone-free are the equivalent of certified organic. They are not. Organic certification requires meeting specific guidelines throughout all stages of production. In Ontario and Canada, the certification of organic farms is carried out by third party certification bodies which have been approved by the Canadian Food Inspection Agency (CFIA). In some cases, businesses may (knowingly or unknowingly) mislead customers into believing that their products are produced to the same standards, or higher, than the COS. The Canada Organic Standards are a detailed and rigorous set of agricultural management, processing, handling and labelling practices, accompanied by lists of permitted substances. Organic practices are about more than pesticides and herbicides: they are about building the soil, reducing the impact of agriculture on the land and environment, nurturing strong and interconnected rural communities, and limiting the amount of carbon that is released into the atmosphere. Becoming certified organic entails a whole host of necessary precautions to avoid contamination, including detailed record keeping. Because consumers hear conflicting views on what it means to be “organic” from various sources, there is a growing sense of confusion around the term. In order to ensure that the the term organic is meaningful to all Ontarians, it is imperative that the organic brand be protected by provincial regulation. What about small, uncertified farms who can’t afford to transition to certified organic? OCO understands that there is a financial burden involved in becoming certified, and that it is amplified for small, diversified farmers, who pay more for a mixed operation, since crops, livestock, maple and pasture are all certified separately. A major goal of our efforts to promote regulation is to elicit more dedicated support for farmers-- especially small, diversified farms. We want to work together with the sector to create a made-in-Ontario solution that is inclusive and fair for all scales and sizes of organic businesses. Without dedicated organic regulation, there is no political imperative for government to provide specific and dedicated support to the sector. The bottom line is that all farms should be rewarded for reducing their impact on the environment and improving the health of Ontario’s soils. 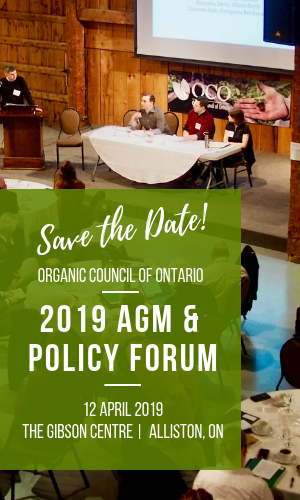 What does OCO recommend for a future Ontario Organic Regulation? We call on the Government of Ontario to consult with Ontario’s organic sector via OCO to produce and implement regulations to assure consumers that food labelled as “organic” at a minimum meets the Canada Organic Standard and that regulations are comparable to those of other Canadian provinces. A low-cost complaints-based enforcement capacity with appropriate and incremental penalties for offences. The ability to deal with potential mislabelling swiftly and with flexible enforcement options, including administrative penalties. Certification subsidies and/or transitional supports for small-scale operations, new entrants and diversified farms. The potential for a a special small-scale certification process that is less onerous for low-risk small-scale and/or direct marketing farms. The potential for other categories of products to be certified organic including textiles and body care products. A provision to allow for information sharing by certification bodies in support of a provincial data strategy. Provisions for monitoring of retail labeling.